While I absolutely love the warmth and sunshine of the summer, with it comes some not so pleasant things, such as sunburn, bug bites, and dry, flaky skin. And now with a squirmy toddler who loves to play in the dirt and pull off her hat when I’m not looking, the struggle has gotten even more real. Luckily, my homemade aloe vera after-sun lotion is the perfect solution for the whole family for most summer-related skin issues. This homemade aloe vera after-sun lotion contains four nutrient-rich ingredients to rehydrate and soothe sun-kissed skin: aloe vera gel, coconut oil, olive oil, and shea butter. 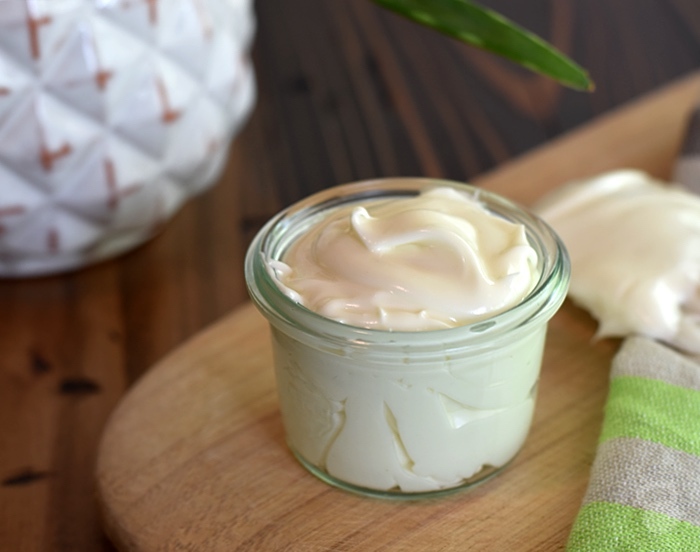 Aloe vera is widely know for its ability to heal skin burns, wounds, and other skin issues, and in this homemade lotion recipe, it’s whipped in a blender so that it has a softer texture. The second main ingredient, coconut oil, is a fantastic moisturizer. Studies show coconut oil significantly improves dryness, and does so better in comparison to other oils because of its antibacterial and emollient effects. It’s also been found to improve skin hydration and lipid barrier function, and reduce skin infections. Because it it solid at room temperature, it also plays a role in giving this homemade aloe vera after-sun lotion a silky texture. Olive oil is also great as a moisturizer, and contains antioxidants, which can help repair skin damage. The last ingredient, shea butter, is a luxurious butter that is anti-inflammatory and well known for its ability to improve dry skin. In short, each ingredient in this homemade aloe vera after-sun lotion works together to create an incredibly powerful and effective moisturizer. If you’re interested in the sciencey things, this homemade lotion works so well because it combines the emollient effects of coconut oil, and the occlusive effects of olive oil with aloe vera, which is a humectant. Humectants draw water from the air to your skin, while emollients and occlusive agents smooth the skin’s surface, and prevent water loss through the skin. Lastly, this homemade lotion is made with natural ingredients and is incredibly affordable, which helps when your money seems to fly out the window because the kid needs new shoes again. Please note: if you’re planning on applying this lotion to small humans, I recommend not adding in the essential oils. Both peppermint and lavender essential oil are great for soothing and cooling irritated skin; however, they are not essential to this recipe. Heat the coconut oil, beeswax, shea butter, and olive oil in a modified double boiler, stirring occasionally to combine. Once the mixture is liquid, pour it into a glass blender and allow the mixture to cool completely, about one to two hours. Once the mixture has cooled and is slightly hardened, take a spatula and scrap down the sides of the blender to loosen the contents. Turn the blender on low and slowly pour the aloe vera gel into the mixture, stopping occasionally to allow the contents to combine. If the mixture gets “stuck” in the blender, turn the machine off and scrap down the sides of the blender. Whip the mixture by hand until a light, fluffy texture forms. Once the aloe vera is completely combined, add the essential oil (optional) and mix well. Transfer the lotion to an airtight glass container. It is super important to let the mixture completely cool in the blender before adding the aloe vera gel. Set a timer, walk away, and do something else. Make sure the aloe vera gel is also at room temperature. You’ll get the best results using a natural aloe vera gel. Aloe vera juice or homemade gel will not work the same. This homemade aloe vera after-sun lotion is good for all skin types. If you plan to use it on your face, please test it on a small area of your skin for a few days in a row prior to regular use to make sure you do not have any negative reactions to it (for example, redness or a rash). Store a small amount of this lotion in a glass jar in your bathroom for immediate use, and keep the rest of it in the refrigerator in an airtight container. You can expect to get about 3-4 months storage life from this recipe. Have any questions about this Homemade Aloe Vera After-Sun Lotion? Ask below in the comments and I’ll do my best to help! Such a versatile plant, it can be used for keeping produce fresh, lowering blood sugar, natural laxative etc. Can you use aloe vera powder in this recipe? No. Only aloe vera gel. 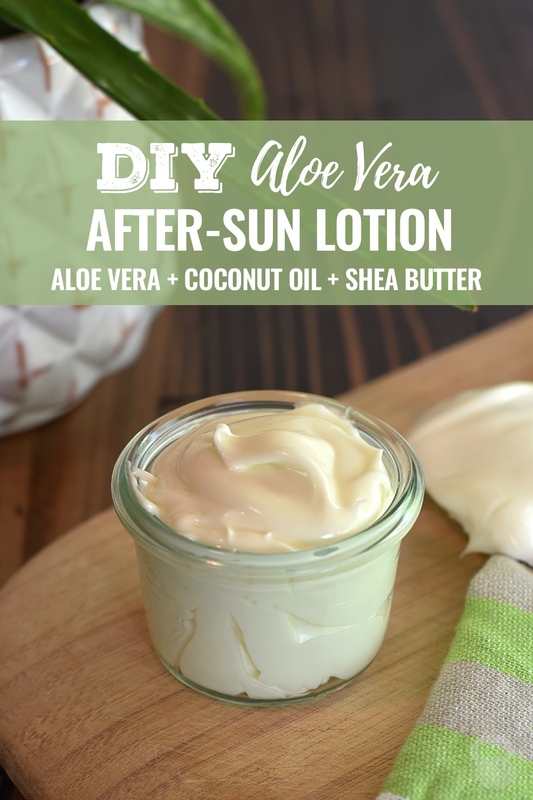 I just made your Aloe Vera after-Sun Lotion for the first time and LOVE it! I did want to make you aware of something I discovered though. I used aloe that was in my fridge (the exact kind you recommend), and I think that may have posed a tiny bit of a problem in that it basically created “pockets” of aloe juice and the mixture was not able to become “creamy”. It created the mixture to become cold and not pliable and didn’t allow the aloe juice to FULLY incorporate (leaving juice around the mixture that would not mix in). Just thought I would let you know. So I think if I made it again I would leave my 1 cup of aloe juice out to get to room temperature. Thanks for the recipe! I LOVE the way it makes my skin feel!! GREAT advice! Thank you for that! I always open a new bottle to make it so I haven’t discovered that that’s an issue. Thanks so much!